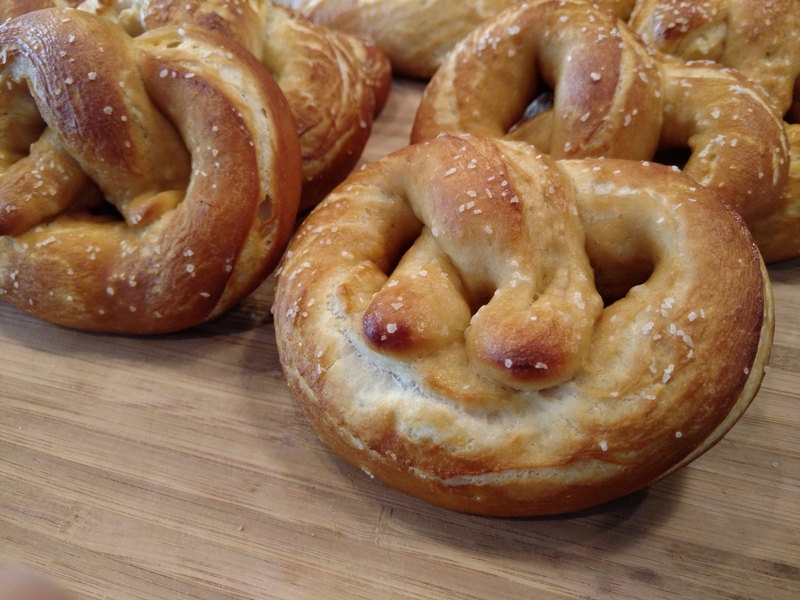 Everyone loves a fresh soft pretzel, the possibilities are endless for mix-ins, dips and toppings. These smell amazing and are up there with the best pretzels I have ever had. Combine water, sugar, salt and yeast in a mixing bowl. Let it sit for about 5 minutes or until the yeast begins to foam. Add the flour and butter and turn the mixer to low and mix until everything is combined and the dough balls up. Place 1 cup of water in microwave and heat on high for 2 minutes. This will act as our proofing box. Place dough in an oiled bowl and cover for about 1 hour, place in warm / humid microwave with door shut. After 1 hour, preheat your oven to 450 degrees, lay 2 baking sheets with parchment paper and lightly oil the parchment paper. Add the water and baking soda to a roasting pan and bring to a rolling boil, meanwhile form the pretzels. Once the dough has risen, cut it into 12 equal pieces, roll each piece into a rope and make a U shape, then press the ends of the rope at the bottom of the U shape and pinch the ends. Place your shaped pretzels onto the oiled parchment paper line baking sheets. Carefully place the pretzels into the boiling water for 30 seconds one at a time, remove from the boiling water using a flat spatula and put them back on the oiled parchment paper lined baking sheets. Repeat for remaining pretzels. Brush pretzels with the egg wash and sprinkle each one with a little kosher salt. Bake for 10 to 12 minutes or until deeply golden brown.